There is great knowledge wealth to be mined by developing farmers who attend Grain SA’s Farmer Development study group meetings regularly. Farming has always involved hard work and it truly can be said that farmers are not afraid to work hard in pursuit of their goals. However, these days farming requires far more than just hard work. The Grain SA Farmer Development team has identified certain factors which are common to new farmers around the country that slow development such as a lack of knowledge, skills and experience particularly regarding modern technology and recognised best practices for agriculture in the modern world. Farming is a very broad field and farmers today need to understand an overwhelming diversity of issues. Theoretical knowledge alone is not enough. Farmers learn from years and years of experience. In the South African context, developing farmers are mostly new entrants to the game and the rules of this game are complicated. Good performance requires extreme fitness. With the profit margin being under extreme pressure, there is no margin for error. How do you gain experience, and who will catch you if you fall? Jerry Mthombothi is based in Nelspruit and he mentors over 1 200 farmers who attend 17 study groups. Du Toit van der Westhuizen is based inLichtenburg and visits 15 Study groups with over 630 members. Jurie Mentz manages eleven study groups from Louwsburg which sees over 650 members. Graeme Engelbrecht is based in Dundee and manages 15 study groups which have almost 900 farmer members. Johan Kriel manages from Ladybrand and assists 15 study groups with about 520 new era commercial farmers, advanced farmers, smallholder and subsistence farmer members. Sinelizwi Fakade manages the programme from Mthatha and runs 33 study groups with a total membership of 2 572 farmers. The Kokstad office has been managed by Ian Househam and more recently Luke Collier. This office runs 15 study groups with a total membership of 1 185 farmers. The same management team oversee the Maclear office which was operating 15 study groups and had over 1 000 members. Liana Stroebel is the Regional Manager for the project in the western and southern Cape. The office is based in Paarl and operates seven study groups with about 88 farmers. There is an open invitation for interested farmers to sign up to their nearest study group for the nominal fee of R40,00 per year (2017 rates). The only requirement is that the farmers must want to farm, be eager and willing to learn, and to even make changes if advised, and then to have some form of access to land. 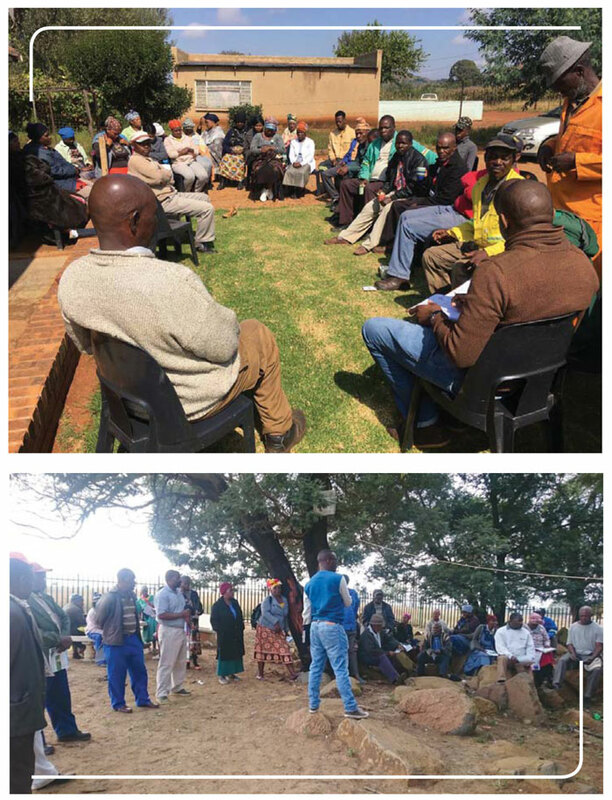 It is through our interactions with farmers who regularly attend their study group meetings that our Regional Managers and Mentors get to know them, learn of their challenges and can get the best idea of how to begin the mentoring and training process. Relationships and trust are key elements of the development path we follow. 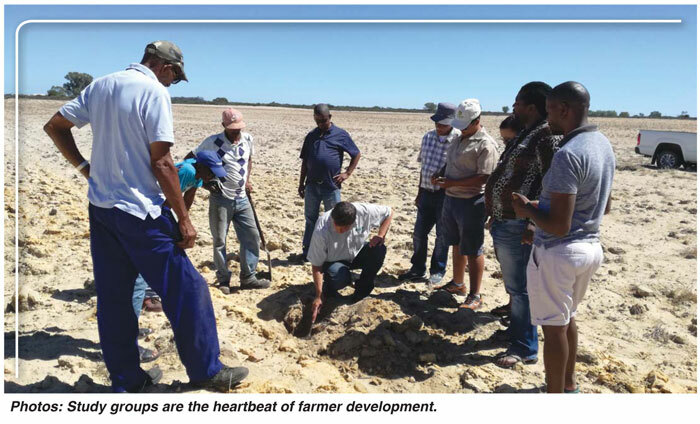 The Grain SA Farmer Development Team believes that sustainable development only occurs once an individual farmer is better equipped to take full responsibility for his or her own farming business. You will never find us financing a farmer directly nor will we be prescriptive about anything and we definitely never will take over the running of any farmers farming operations or business management processes – but WE WILL talk, teach and advise – and WE WILL encourage, chivvy, urge – and yes WE WILL help as far as possible and WE WILL show why modern technology returns best results. We are always looking for fresh new insights to share in creative and dynamic ways. We keep our eyes open as we travel around the country looking for most suitable tools and equipment for small or developing farmers. WE WILL ALWAYS do our best as champions of developing farmers because we believe that we need every farmer to contribute to household and national food security by using the land and resources at their disposal as effectively and responsibly as possible! Our measure of success is not how many hectares are planted, not the total numbers of tons harvested but rather if there has been sustainable, optimal production of profitable crops on EVERY SINGLE HECTARE planted! The Grain SA Farmer Development team members have proved themselves to be reliable and have been ‘pitching up’ to support farmers for more than 18 years now. We meet in farmers’ homes and sheds, community venues like halls and classrooms and even under big trees…and we go to the fields and see and learn from the good and the bad that we find there. The study group meetings are dynamic and varied in an effort to cover as many relevant and helpful topics as possible. Topics are usually selected according to the rhythm of the seasons so as to offer most support at the right time. We look at slides and video clips and give practical demonstrations where helpful. We don’t hesitate to get down and dirty in the fields and are not afraid of dirtying our hands investigating a funny noise in an engine – but we love to show others how to too! There is always something new to learn. Through study group participation farmers learn from experts and from each other. They learn (and earn) faster than if they were struggling on alone. They get new perspectives and learn new skills from sharing in discussion groups. Farming is a lifelong journey which never ends! Article submitted by Jenny Mathews, Pula Imvula contributor. For more information, send an email to jenjonmat@gmail.com .